It’s been approximately a year since we’ve calculated and presented the up-to-date performance for our “Fundamental Free Lunch” portfolio. The original premise behind the model was to take a highly regarded single fundamental value factor, in this case the Enterprise Value to EBITDA (EV/EBITDA) ratio, that’s demonstrated strong potential to generate outsized returns over time and see how applying it to a real-world global subset of stocks over time actually performs. To accomplish this a few years ago, we used our trusty Bloomberg to go back as far as we could with the S&P Global 1200 index to determine the bottom decile (120 stocks) in terms of EV/EBITDA valuation at the end of each year, putting those stocks in a portfolio, calculating the performance for the subsequent year, and rebalancing each December 31st. Ultimately, the historical performance stream has helped us understand a few key points about value investing. First, simplicity trumps complexity. 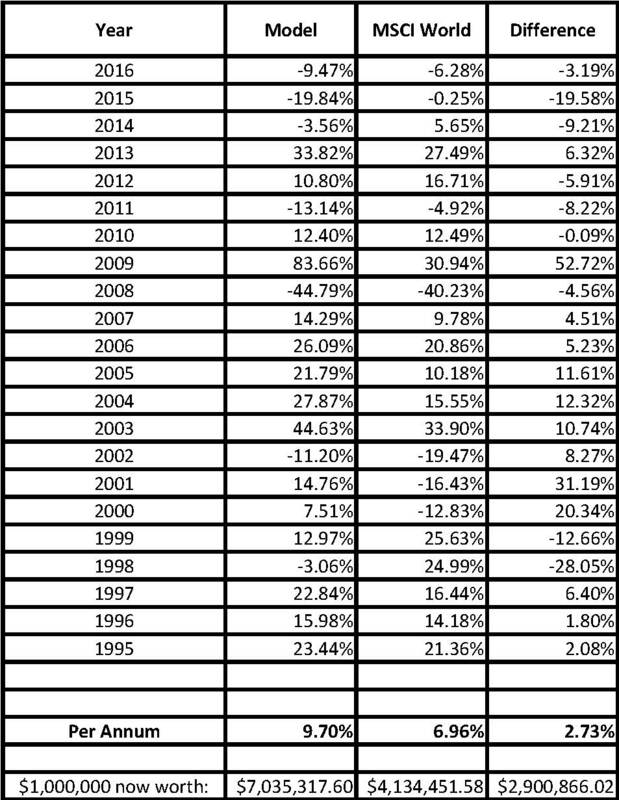 As we’ve demonstrated in the past, and show below, simply choosing the bottom EV/EBITDA decile stocks year after year, without considering any other factor, quantitative or qualitative, has produced outsized returns over time. Second, and perhaps most importantly, the return stream shows that value investing produces lumpy performance, on both a relative and absolute basis. 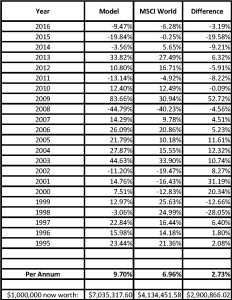 While the outperformance over the past 21+ years has been substantial, there are periods, including the current one, that test the patience and fortitude of even the heartiest investor. It’s easy for someone to look at this model and say they could’ve hung through thick and thin; but in reality factors like career risk concerns for the professional investor, or behavioral biases and quirks would make this a harrowing journey indeed. We know empirically with value investing that poor timing decisions pertaining to value funds cost investors a significant level of performance. The timing decision problems are influenced heavily by the feast or famine performance streams in value that can drive anyone batty. A few last housekeeping items before presenting the up-to-date data (through mid-day today). First, all returns, portfolio and index, are “total”, i.e. capital appreciation plus dividends. The MSCI World total returns are pulled “as is” from the Bloomberg total return function. For the model portfolio, we assume a conservative annual 1.85% dividend yield, which is well below the historical annualized index levels. Second, we deduct a 2% annual “management fee” from the model each year, which should serve to roughly account for costs, slippage, professional management fees, or any of the other real world factors that impact performance. As one can see, this global value-based model portfolio has outperformed the MSCI World over time using the bottom decile each year-end for EV/EBITDA as the sold investment decision factor. Notice the streakiness and disparities in performance though. During the late 1990s growth surge at the end of the internet bubble, this deep value portfolio underperformed to the tune of over 40% in ‘98/’99. Once the bubble cracked and value took over during the 2000s, the model overcame the underperformance and then some. As anybody with a value orientation knows, the years since the financial crisis have been awful for value stocks relative to growth stocks, not too dissimilar to the late 1990s. That harrowing underperformance of late is reflected above, with last year’s underperformance representing the second worst level of underperformance over the 21-year span. As has been the pattern during this cycle, this year is off to an inauspicious start as well. Matter of fact, through today, this portfolio is completely flat since year-end 2009 versus 57% total returns for the MSCI World. Still, even accounting for this cycle’s weakness, the portfolio has outperformed by nearly 3% per annum. It’s surely easy to talk about “long-term” success, data, and sticking with plans when looking at performance sheets. Living in the middle of volatile periods of outperformance and underperformance, especially within the world of value investing, puts plans and investing psychology to the ultimate test. Markets, no matter what corner of the market universe you like to hang out in, tend to find the perfect path to pushing investors towards the maximum pain threshold. The difference between success and failure, in many cases, is being able to resist carrying out the psychologically expedient action and sticking with the gameplan.